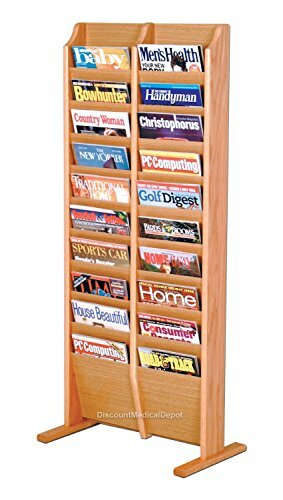 Our gorgeous light oak magazine display rack offers versatility and style in a compact unit. Freestanding floor magazine racks are extremely easy to deploy and can be set up just about anywhere. Our unique overlapping design neatly displays and organizes your literature, keeping it tidy and visible in the least amount of space. This floor magazine rack can be set up in just about any office, waiting room or lobby. Our racks feature furniture quality construction with 3/4" solid oak sides sealed in a durable state-of-the-art finish. Made in the USA.